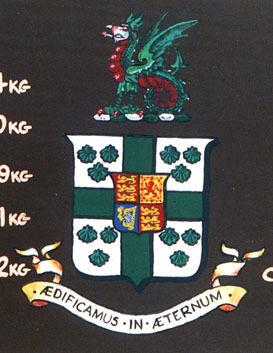 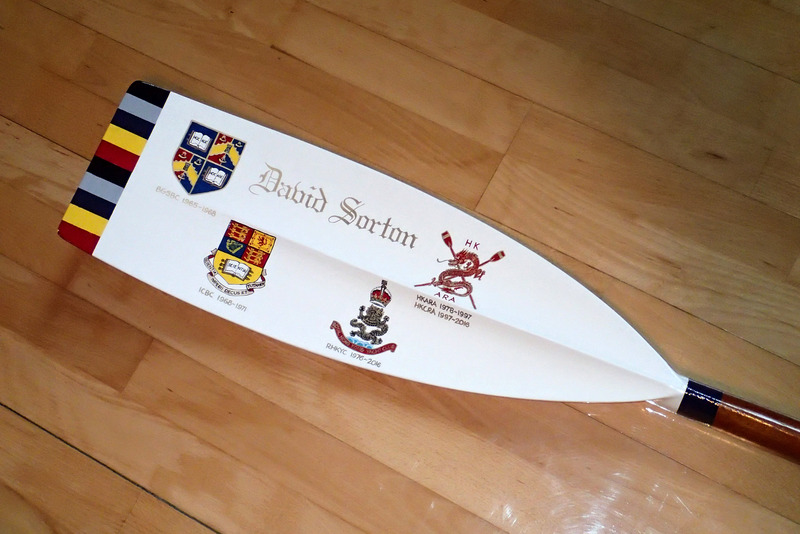 Where do I find an oar to paint? 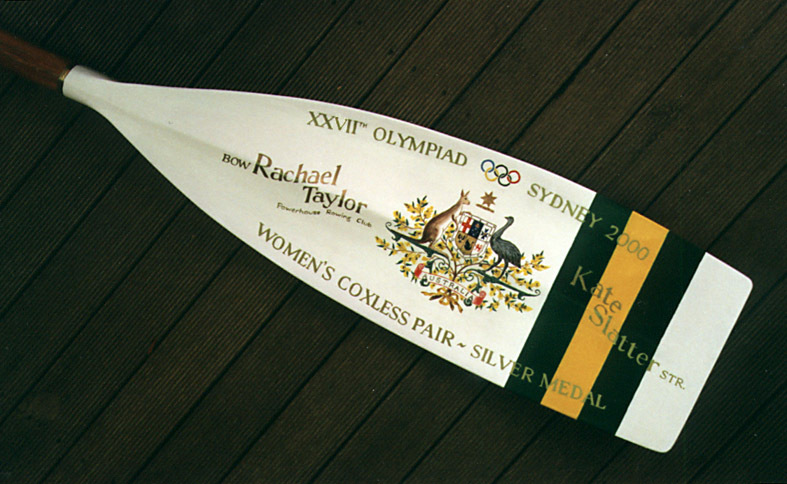 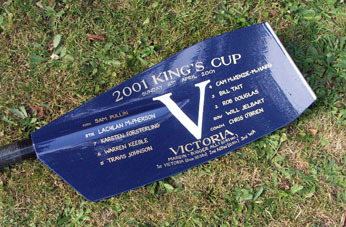 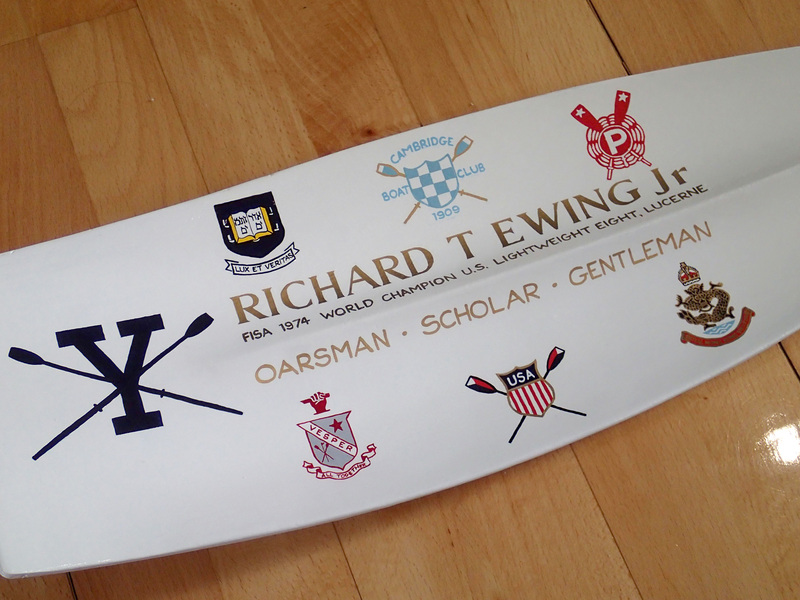 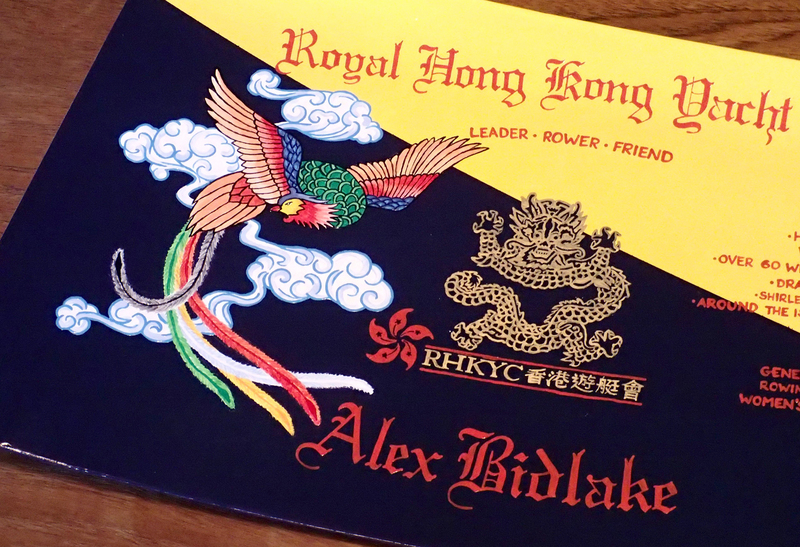 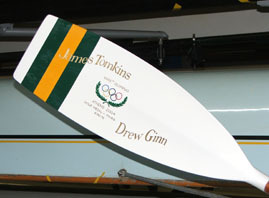 Quite often a client will already own an oar that they want me to paint. 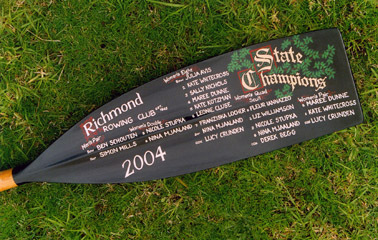 However many people do not have an oar and ask me to help. 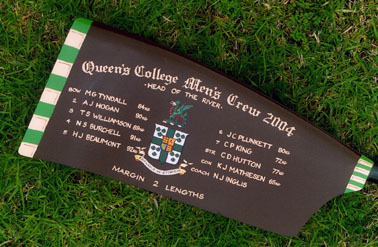 I can find an oar for you, but this is not always very quick as some types of oar are in short supply and not always available. 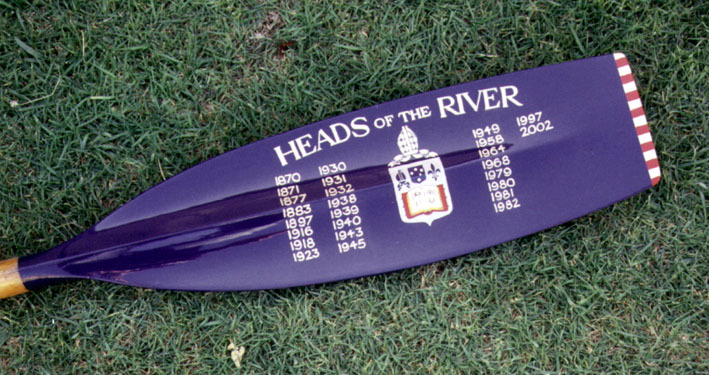 The best place to start looking for an oar is your own club, and those nearby. 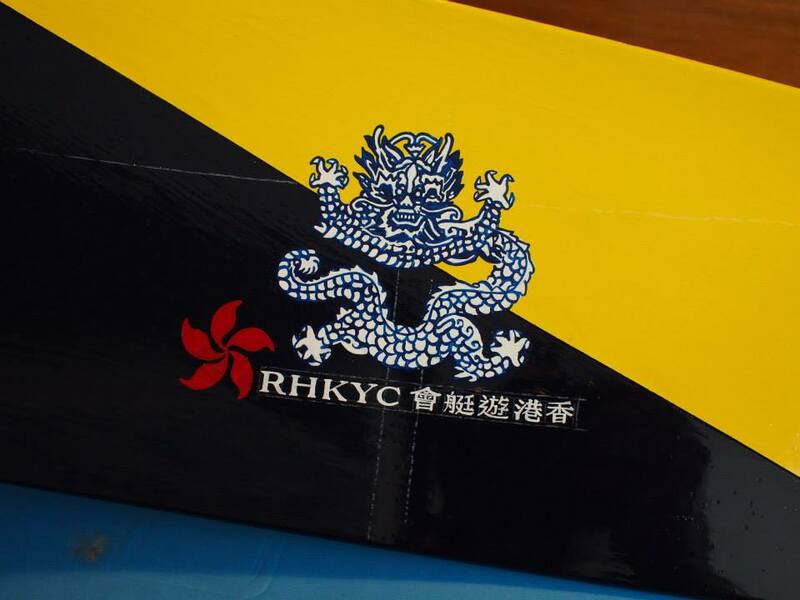 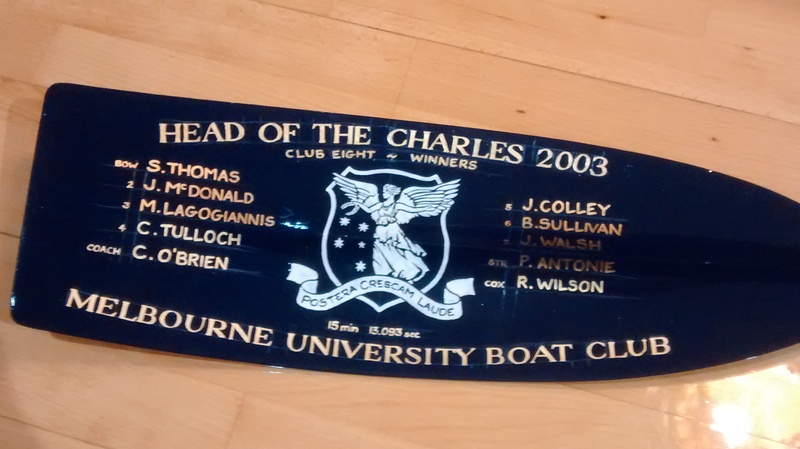 From there you might try the larger rowing schools and possibly even asking around at clubs further from home (either at regattas or by calling/emailing them). 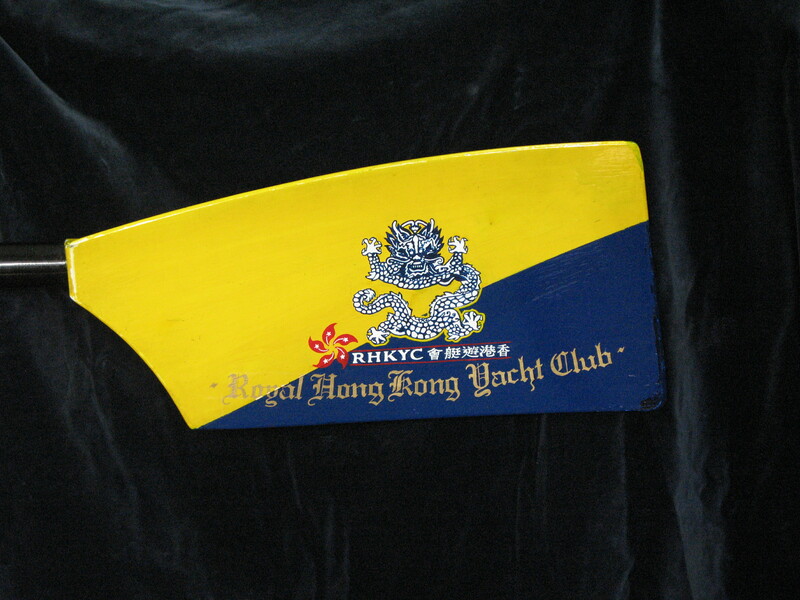 Boatmen at the larger clubs and schools have been known to stash these sorts of things, or know who has, so seek them out and ask. 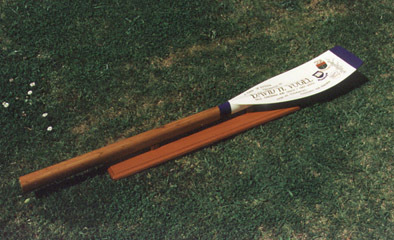 Timber oars with the very long and narrow blade (pre-1960s) are very hard to find. 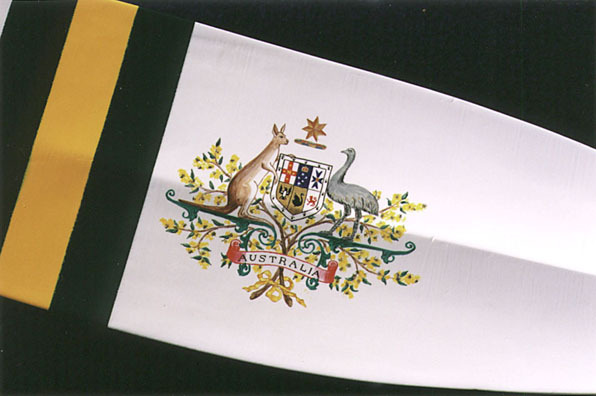 I know of a couple of potential suppliers in the USA and Australia, but the cost is likely to be very high. 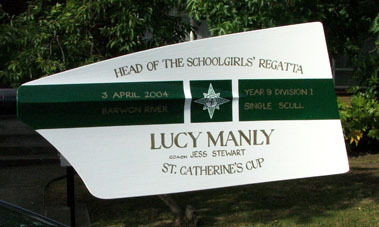 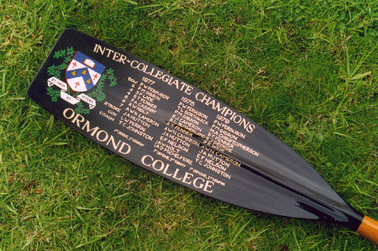 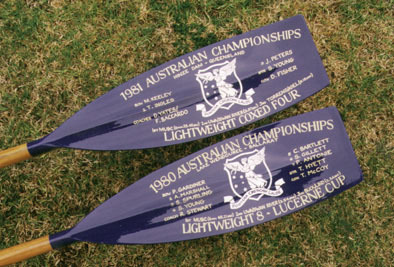 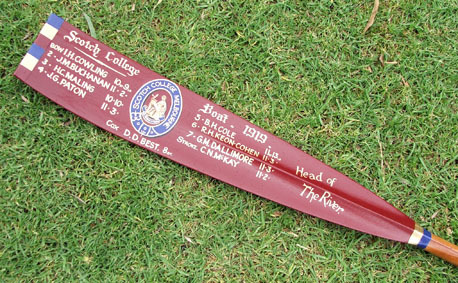 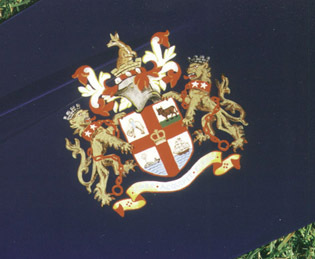 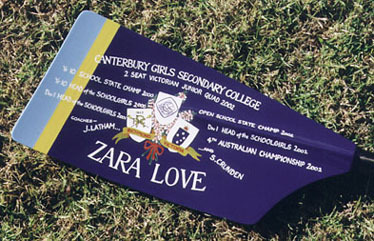 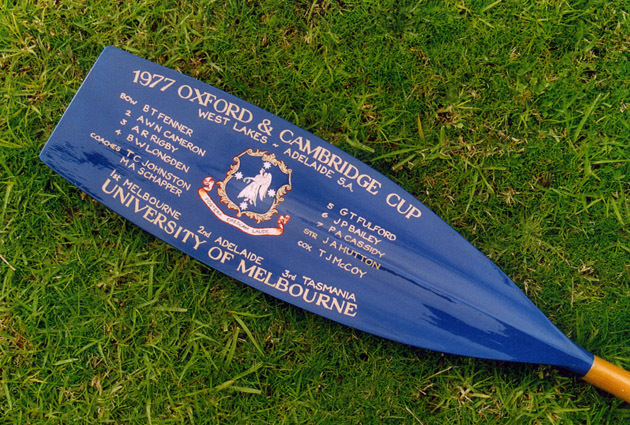 The post-1960 ‘macon’ style of timber oars are readily available as many clubs were still using these into the 1980s and early 1990s. 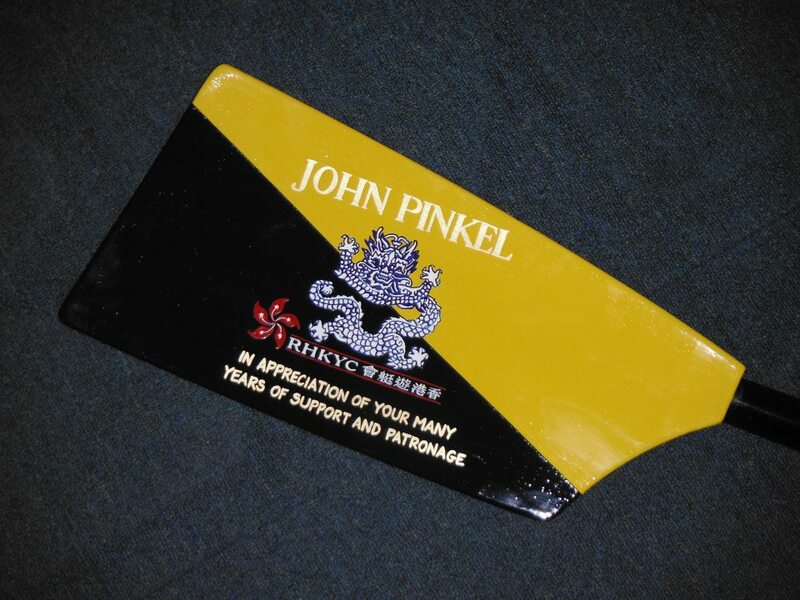 However these are also becoming less common and the prices are going up as clubs realise their scarcity value. 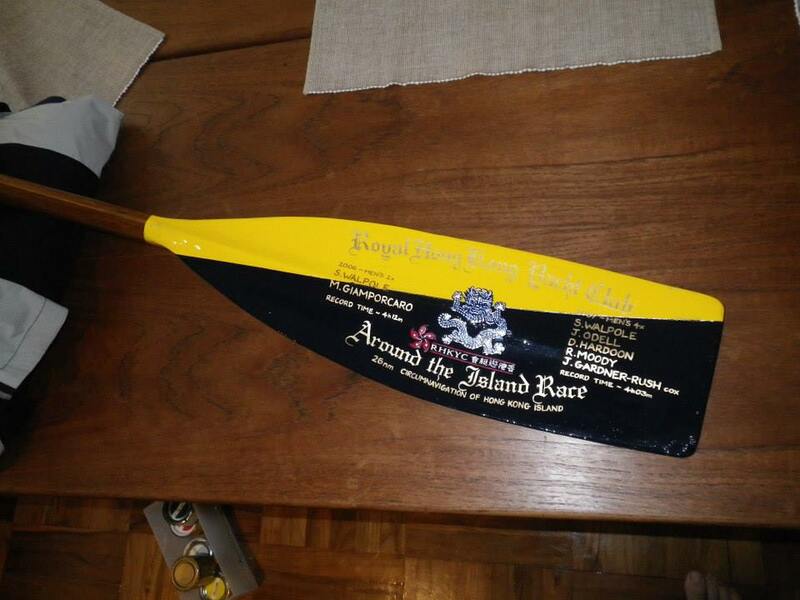 Early carbon shafted macon oars are quite cheap, as are older sets of cleaver (or hatchet) oars. 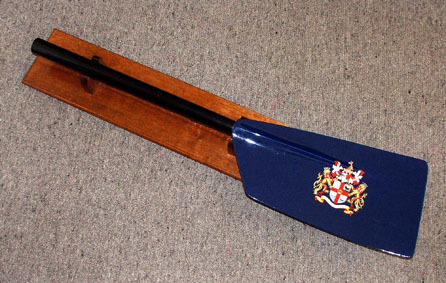 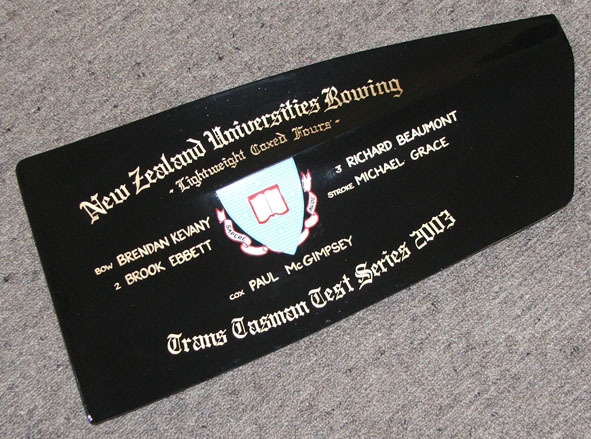 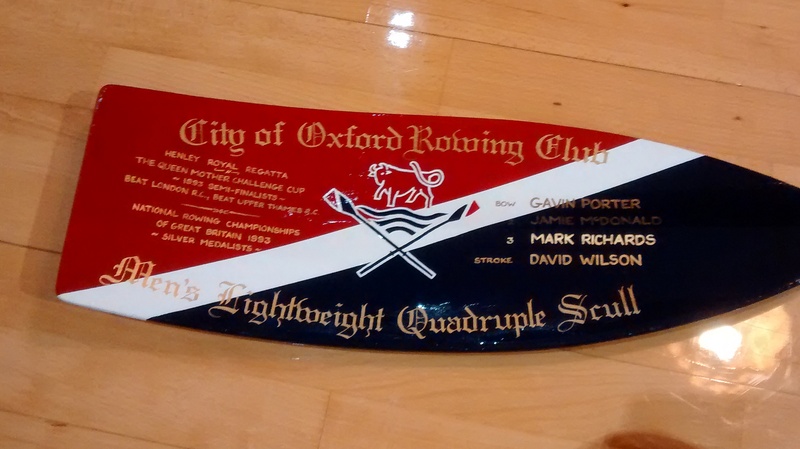 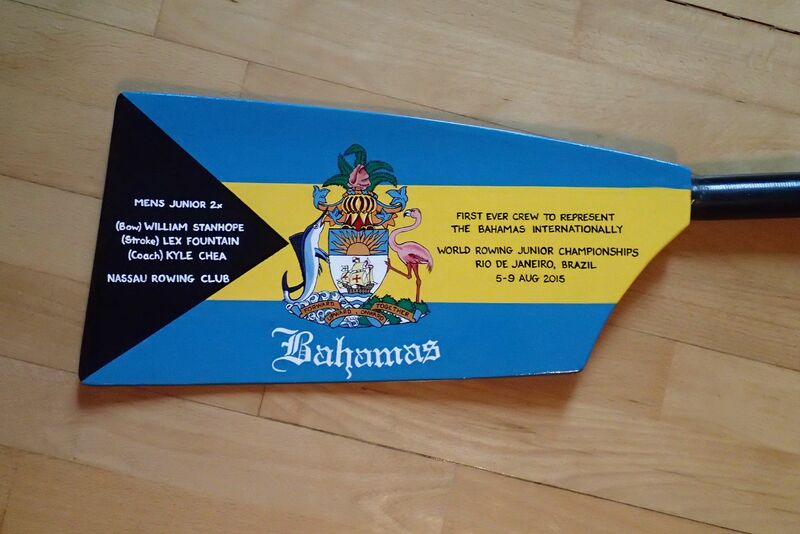 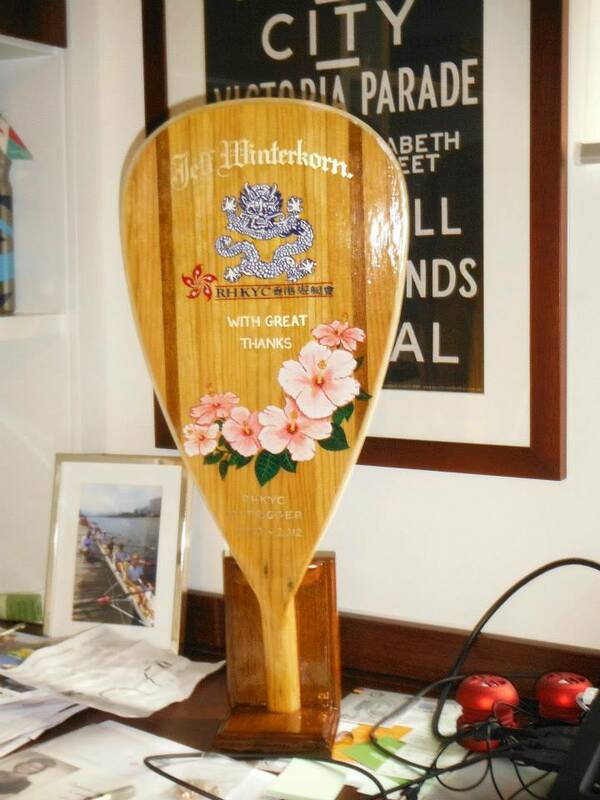 Your club might be very happy to off load one these ‘useless’ old oars for a small donation to the new boat fund. 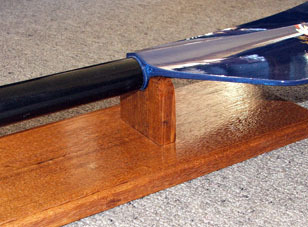 The cheapest and most common option is a modern blade without the full shaft. 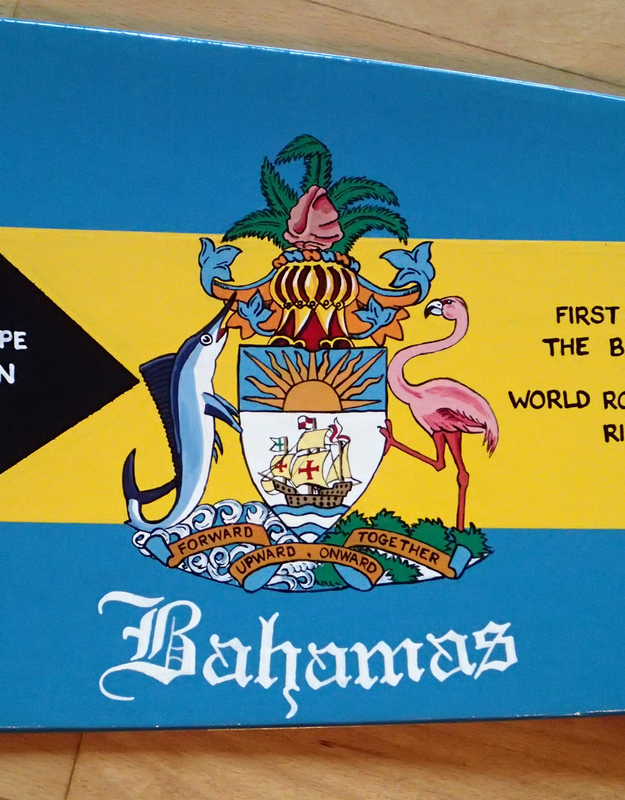 This is usually as a result of an accident. 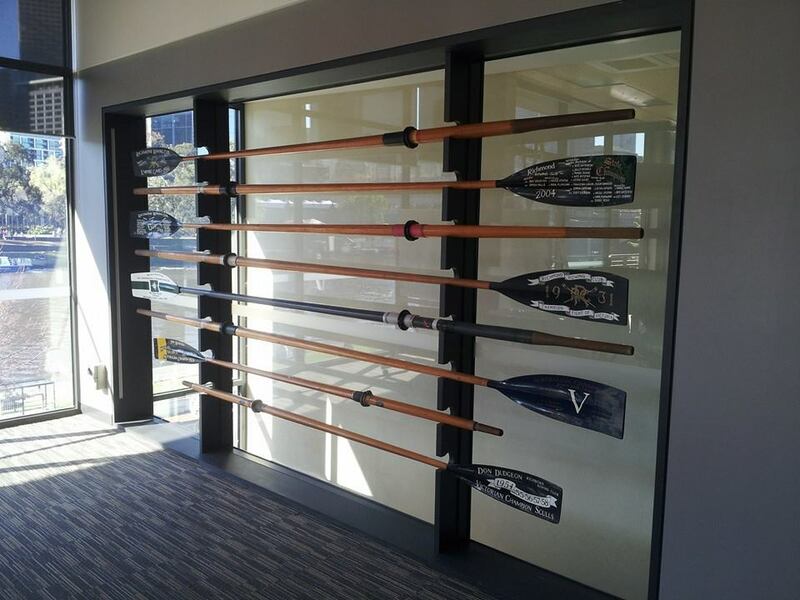 A blade with a short length of shaft can look very good displayed on a wall. 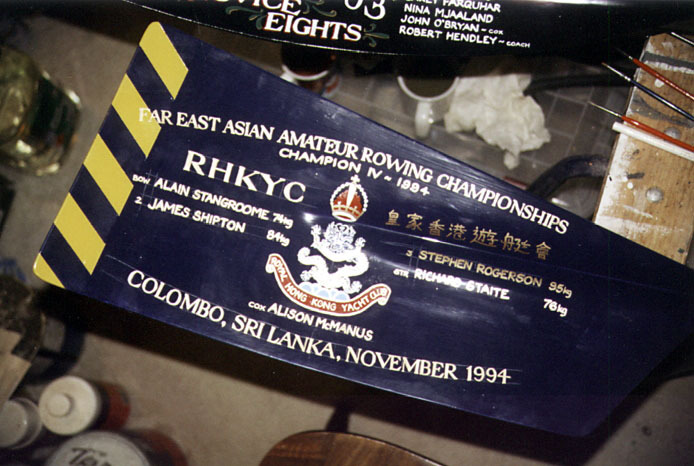 Sometimes a damaged oar shaft can be repaired to a suitable cosmetic standard that it can serve as a full length trophy, so if your broken oar is still hanging together don’t cut it cleanly just yet! 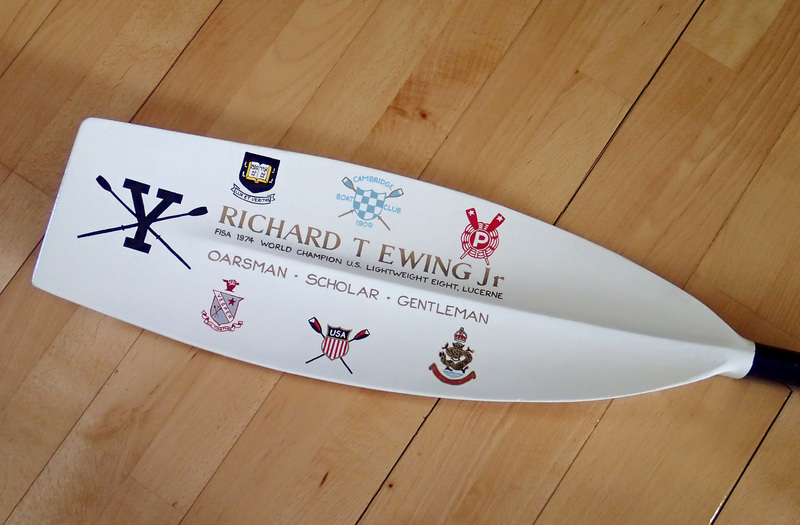 You can also buy a whole new oar. 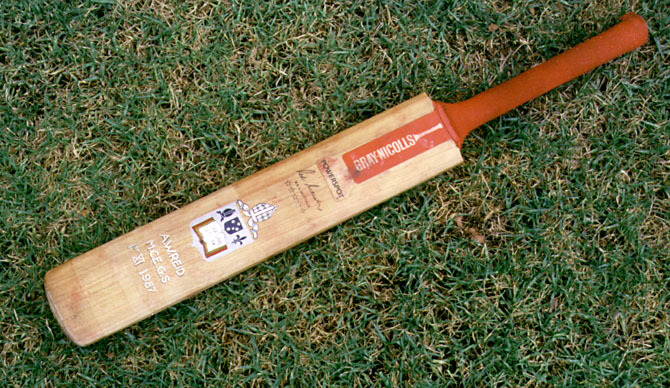 This might be a little expensive but you can always ask the company if there are any that are defective for use or sale that might suit you. 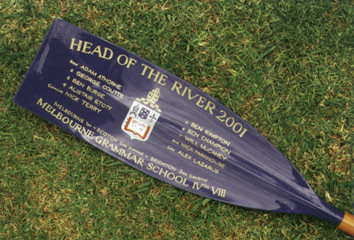 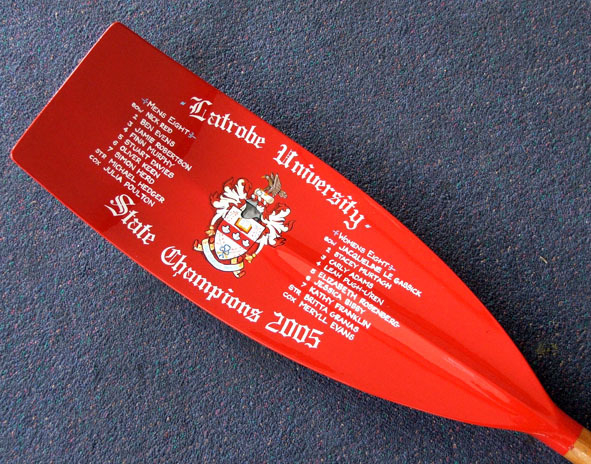 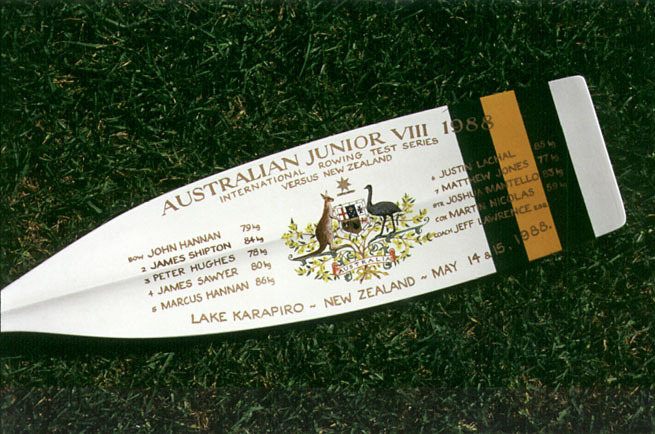 Croker Oars does make a special trophy shaft that is very thin and only suitable for display. 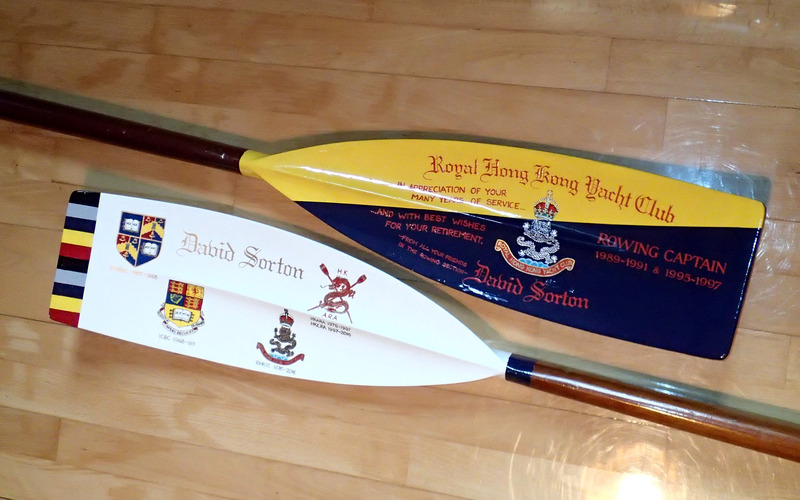 To help clients I always like to develop a few good contacts at clubs who have stocks of useful oars. 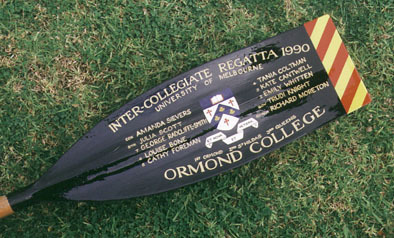 If someone asks for a particular style of oar I then go calling. 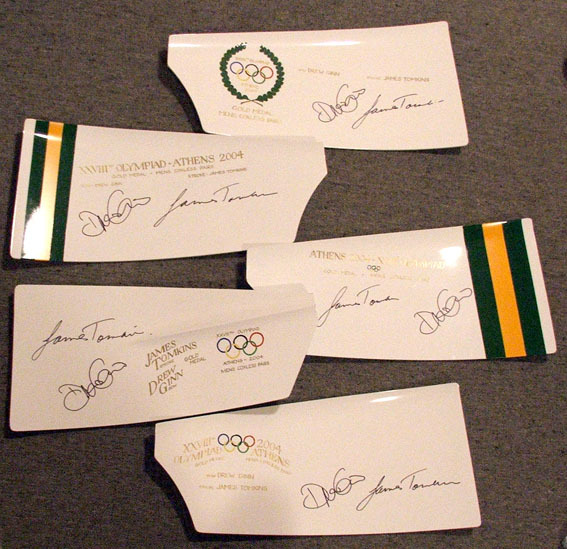 I also like to collect broken blades that might otherwise be thrown away. 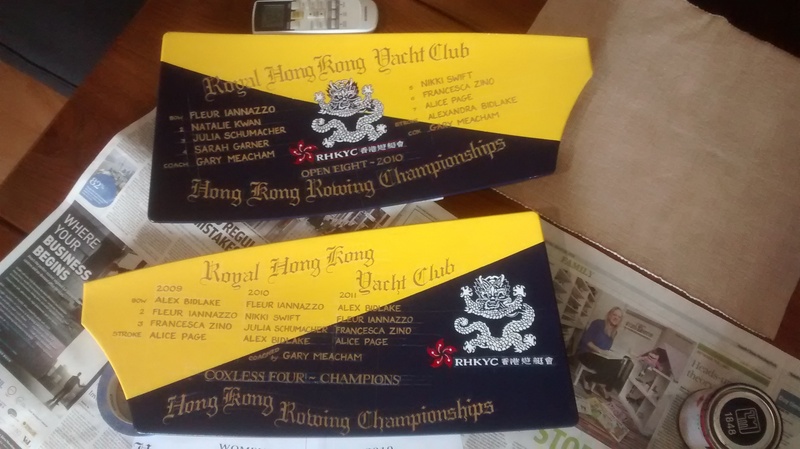 If you or your boatman keeps these to one side I will happily pay a small price for each. 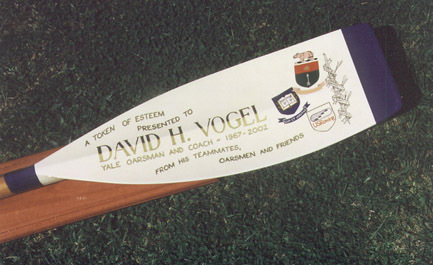 The value of any oar or blade depends on the style, but also the condition. 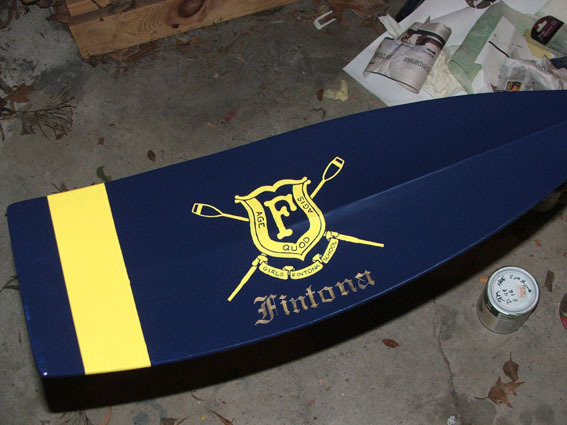 There are many hours of work needed to strip away years of paint, repair cracks and dents, revarnish shafts, then apply a clear and smooth top coat. 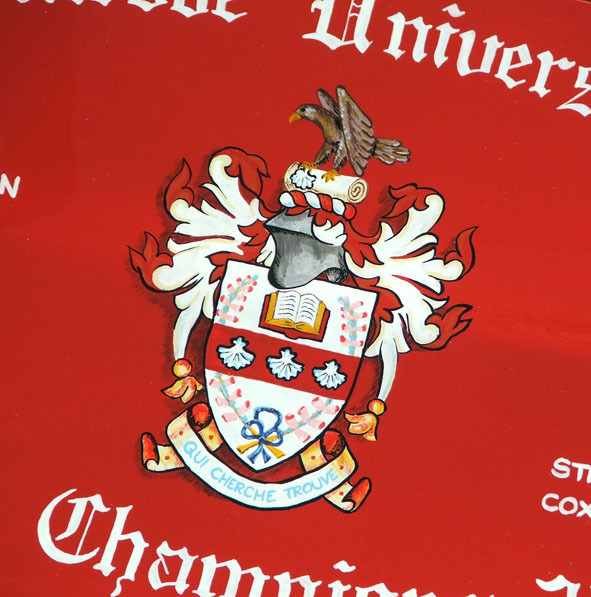 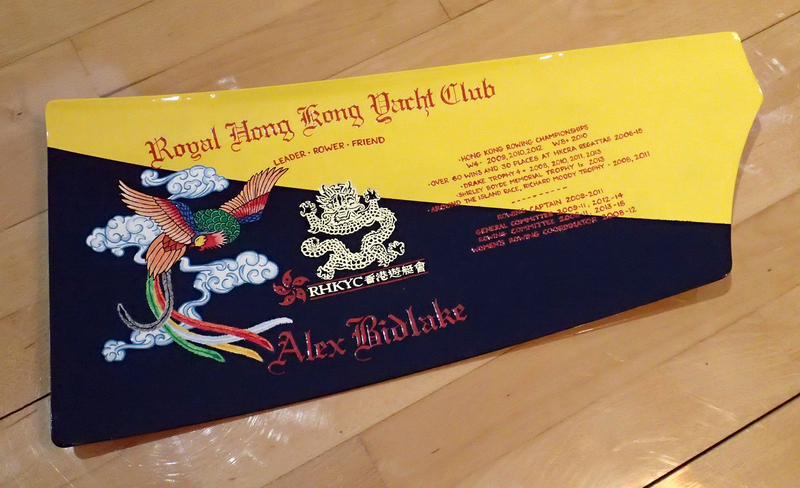 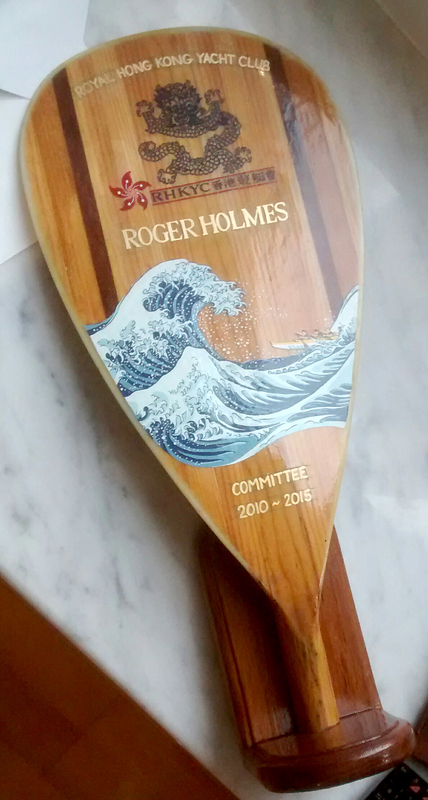 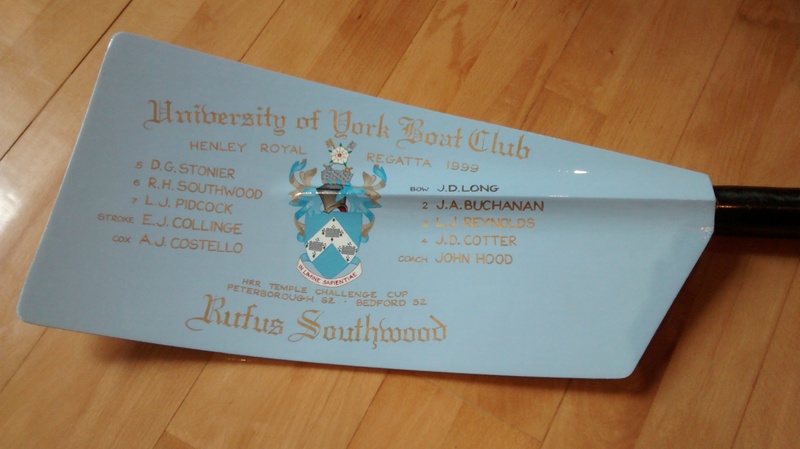 Your oar may not be worth as much as you hoped, but I can not only ensure that it lives on in a meaningful way, but I can also help contribute to the new boat fund at your club! 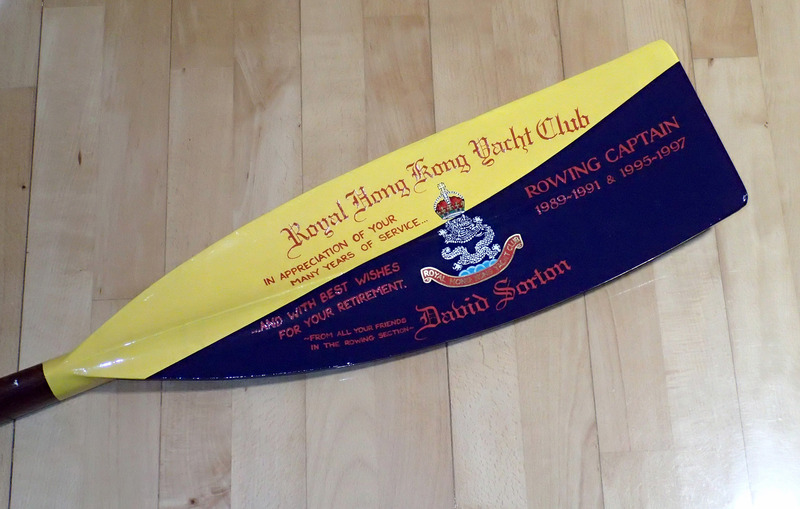 If you have oars or blades for sale, email me and I’ll find a way to have a look.